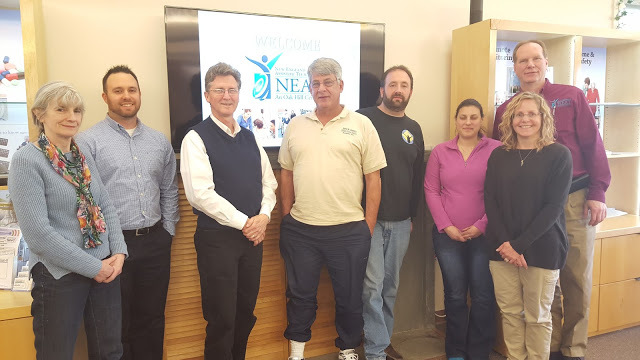 We just finished offering the three-days of classes for the CAPS (Certified Aging In Place Specialist)) designation in Hartford, Connecticut at the New England Assistive Technology (“NEAT”) Center at Oak Hill. Except for a little snow and cooler than normal weather, it was great. The warm exchange in the classroom and the facility more than made up for the outside weather anyway. The NEAT Center is extremely well-suited to host the CAPS classes, and Don Hoerman ATP, the Equipment Restoration Center Manager, (during our lunch breaks) gave us a tour of the basement to highlight the many great services they are providing in terms of refurbishing and repurposing wheelchairs and other equipment and devices – to place with new clients and facilities and to be made available to other durable medical equipment (DME) providers. In fact, the entire NEAT Center team, directed by Katie Hanley, made us feel quite at home for the three days of classes. 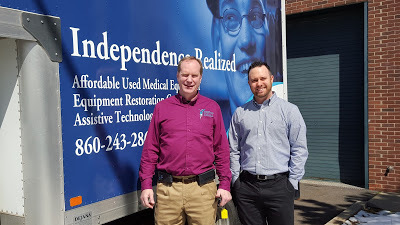 Kris Thompson who is responsible for the IT and other programming services also attended the classes along with Don (Don, on the left, and Kris are pictured below standing in front of one of their vehicles). The attendees, who came from Connecticut, New York, and Massachusetts, represented a great cross-section of the aging-in-place professional services network quite well, In fact, it couldn’t have been designed any better. We had occupational therapists (OTs) – including an OT professor from Springfield College (Massachusetts) – a designer, contractor, and durable medical equipment providers – including the people from the NEAT Center. These disciplines form the nucleus of an effective CAPS delivery system. There are at least two more sessions scheduled when the CAPS classes will be offered in the Connecticut area (June and October although the dates might be adjusted, and the specific locations will be announced as we get a little closer to the exact dates). Watch the website for updates on the place and exact dates of the classes. Congratulations to the newest CAPS designees! !